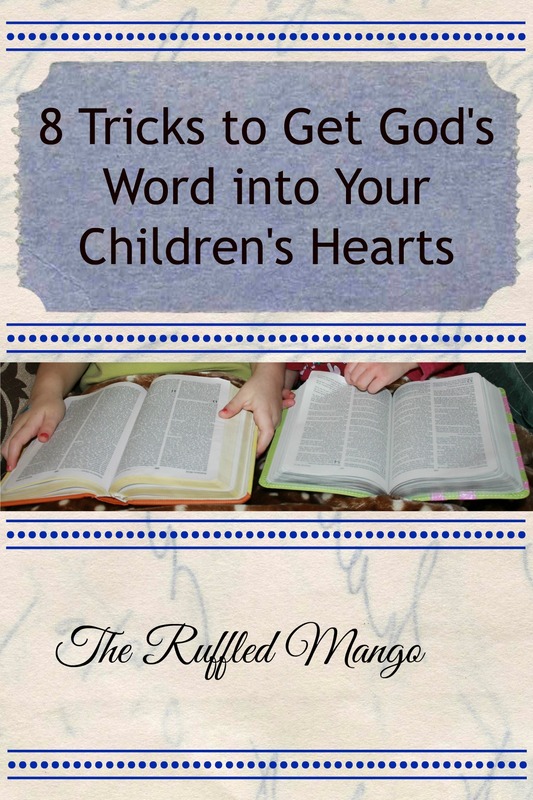 I have a quick piggyback onto Kristen’s fantastic post last week 16 Ways to Get God’s Word into Your Heart, that focuses on the little hearts we are guardians over; those of our children. Did you know that by age 4, a child’s brain is more than twice as active as an adult’s? It’s true. Their brains are sponges, eager to soak up any new knowledge. As parents, teachers, aunts, whatever, we are responsible for filling these brilliant little minds with good things. It’s wonderful if we can teach them to speak a second language fluently or how to play a classical instrument with great skill. 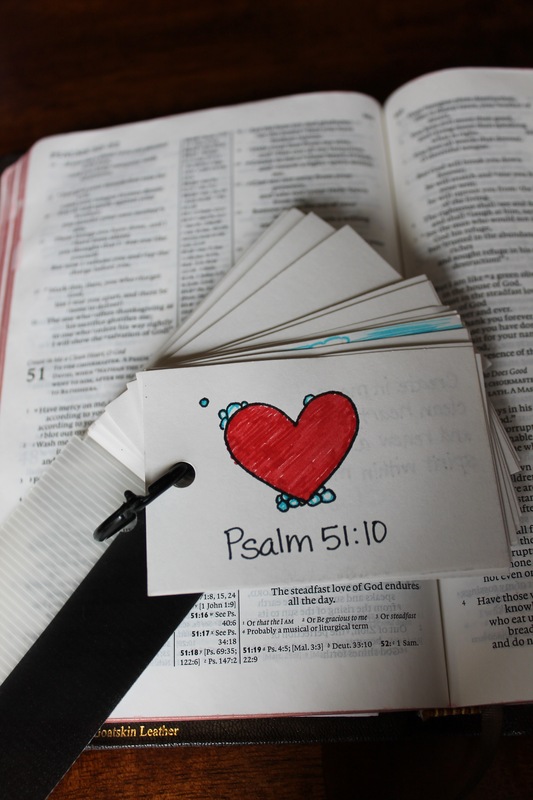 But what is more important than filling them with God’s word and a love for studying it? We know it’s important. But how do we do it? Where should we begin? Below is a short list of methods we use to soak up God’s word. *Note: My kids are still preschool age, and are not yet literate. The options are limitless once your children are old enough to read and write! 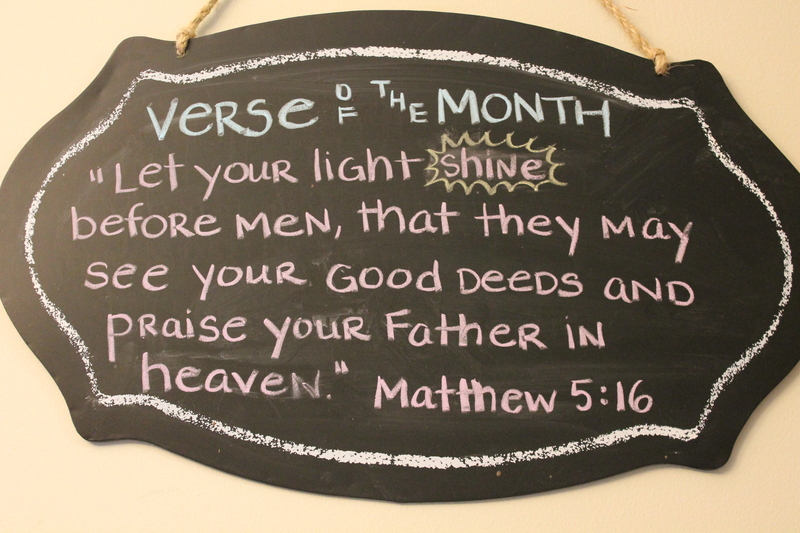 Verse of the Month board – A few years ago I bought this cute little chalkboard sign at Pier 1 Imports. The sign is now hung in our dining room. 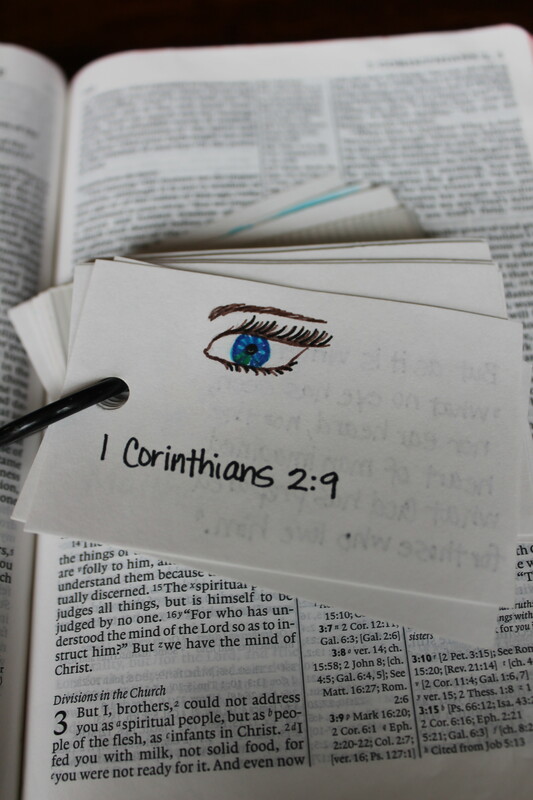 The point is to have a verse displayed for all to see, so that you will be reminded to talk about what it means as a family. We originally planned to do a monthly verse, but now we just leave it up till it is memorized. 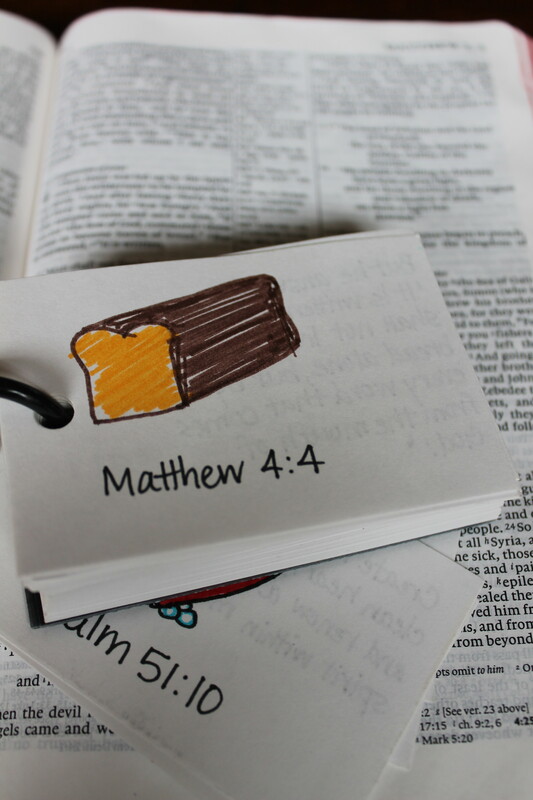 Illustrated flashcards – Pickle Pants’ preschool Sunday school class recently memorized the ten commandments. Her teacher used a series of word pictures that incorporated the number of the commandment and the commandment itself. Pickle Pants LOVED looking at the pictures and telling me what each of them meant. I thought I could carry that same strategy into scripture memorization. I came up with a simple picture to help jog her memory for each verse. She keeps begging me to add more and more verses to our little book of cards. There are 100 cards on the ring and I hope to fill them all up! I’ll share the ones we’ve made so far…no laughing at my drawing skills! And don’t worry if you aren’t artistically inclined – you can always Google clip art images, print them, and glue them onto the cards if that’s more your speed! Now, just for fun, see if my pictures help you figure these verses out without looking them up. Adding motions – Kids are so tactile and frenetic. Use that energy and desire to move to your/their advantage by teaching them motions along with Bible verses. This will lock those verses into their brains. I remember teaching with my friend, Becky, ten years ago. She had the students memorize Luke 2:52 by adding these motions – “And Jesus grew in wisdom (point to head) and stature (move hand from hip upward to indicate growing taller) and in favor with God (move right arm across your body as if shaking someone’s hand) and man (do likewise with the left hand). I will never not know that verse because of those simple motions she taught her kindergarteners. 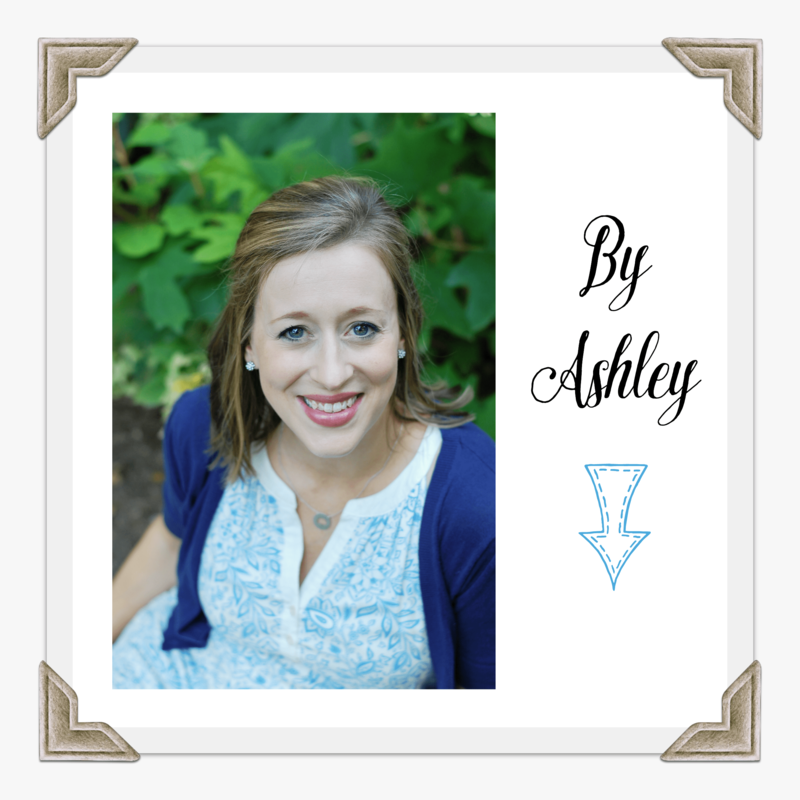 Books of the Bible – Before you can gain any traction with Bible work, your kiddos have to understand the basics. There are two parts of the Bible; the Old and the New Testament. Each testament is made up of books, the books have chapters, the chapters have verses. One great starting point is having them memorize the books of the Bible. I know, I know, there are some really long and hard to pronounce books. But they can do it! Pickle Pants had them down by the time she was two, and I love going back and watching videos of her singing them in her nasally little voice :). I was actually quite sad when she started pronouncing them more correctly. And I got a good laugh the time she asked me, “Why did he bruise James? !” Ha! Scripture Songs – There are several devotional songs that are straight scripture. A few that pop into my mind are, Create in Me a Clean Heart, The Steadfast Love of the Lord Never Ceases, Alleluia (Seek Ye First), and The Lord’s My Shepherd. Incorporate these songs into your family devotionals and they will memorize these passages without even knowing it! 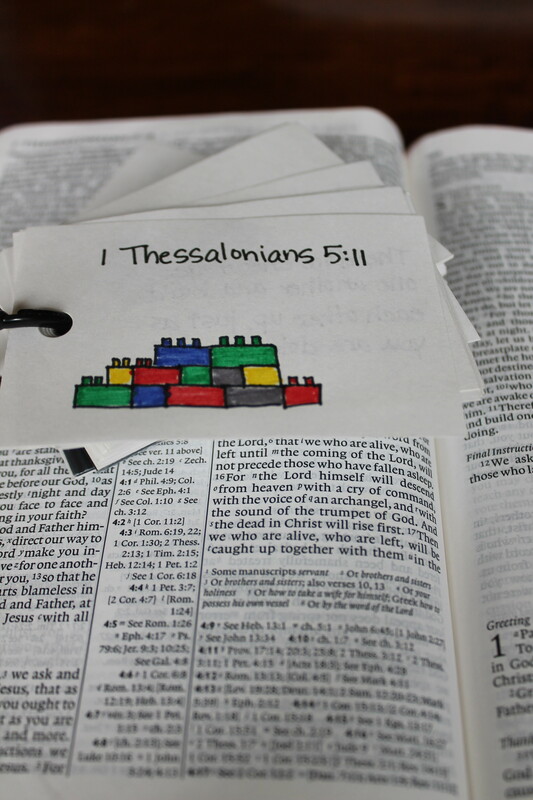 Bible word find – This is a great quiet activity for preschool aged kids in church. 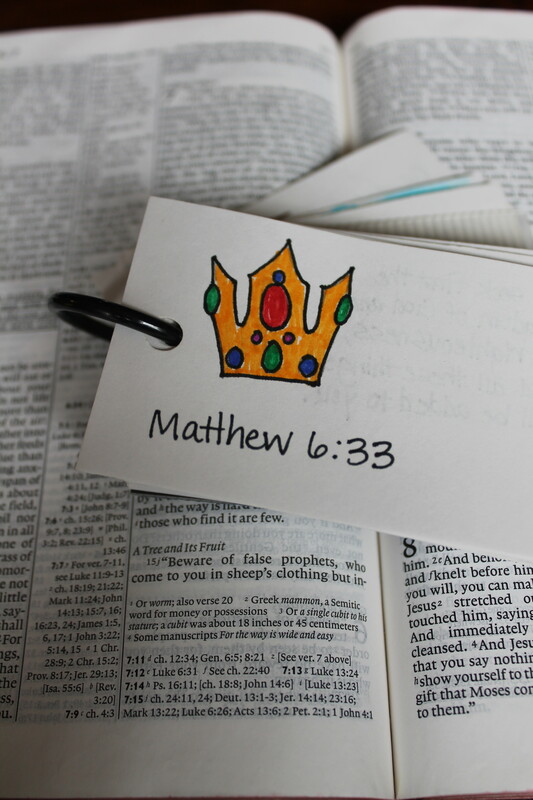 Get a small piece of paper and write a few Bible words, like “Jesus, God, apostles, and faith” with plenty of space underneath each one. Have them open up their Bibles (in this case, to the gospels maybe) and let them search for the words and make a tally mark every time they find one. They don’t have to know how to read, but they will accidentally memorize the words and recognize them in the future. It keeps them busy and quiet, too! 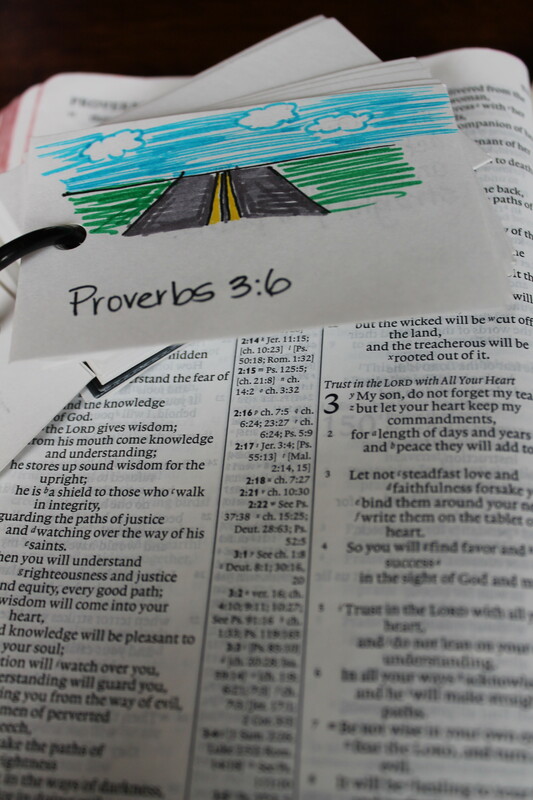 Daily (or nightly) family devotionals – Family devotional time is so important. We can’t expect our kids to grow and mature in the faith from less than two hours a week in Bible class and nothing more. 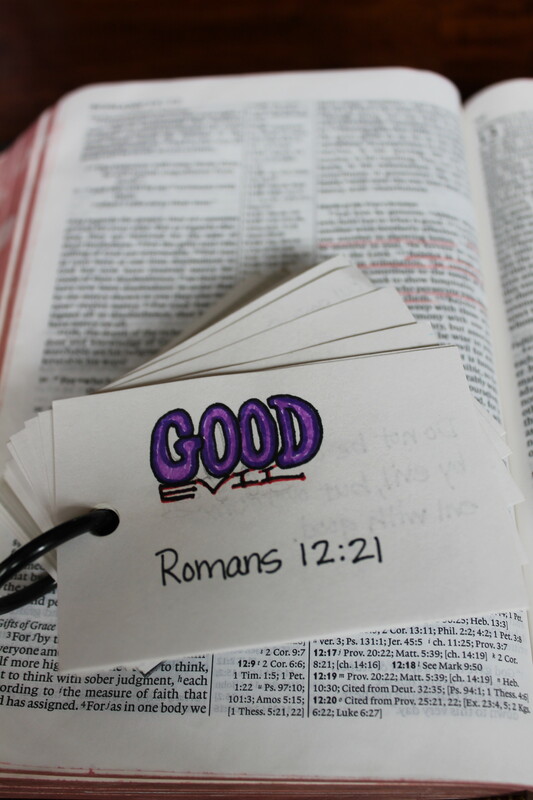 Devotionals don’t have to be long, they don’t have to be fancy, but they have to happen regularly. Our devotional time is part of the kids’ bed time routine. After baths have been given, teeth have been brushed, and a secular story or two have been read, we begin. We read a Bible story, talk about the story, say a prayer together, and finally sing a bunch of Bible songs, starting with silly ones and ending up with calm ones. If we’re out late and need to get the kids in bed as soon as we get home, we will do Bible trivia questions (working off what they are studying in Bible class) and sing songs in lieu of our normal routine. Live it – Put your steel-toed boots on, because this one might hurt a little. We can do all seven of the things listed above every single day from the day our children are born until the day they leave the house and lose their hearts forever…if we ourselves are not living it. If they don’t catch us studying our Bibles, they will not make a habit of studying theirs. If we quote scriptures about encouraging and building up others, but start gossiping about so-and-so as soon as we get in the car, it won’t take them long to see the disconnect. If we’re all talk and little or no walk, they will learn that our faith is a facade, and the hypocrisy will turn them away. This one is the most important. The very best way to teach someone God’s love and his desire for our obedience is to reflect that very love and live it out every day. I know that this is just the tip of the iceberg and there are dozens more brilliant ideas. 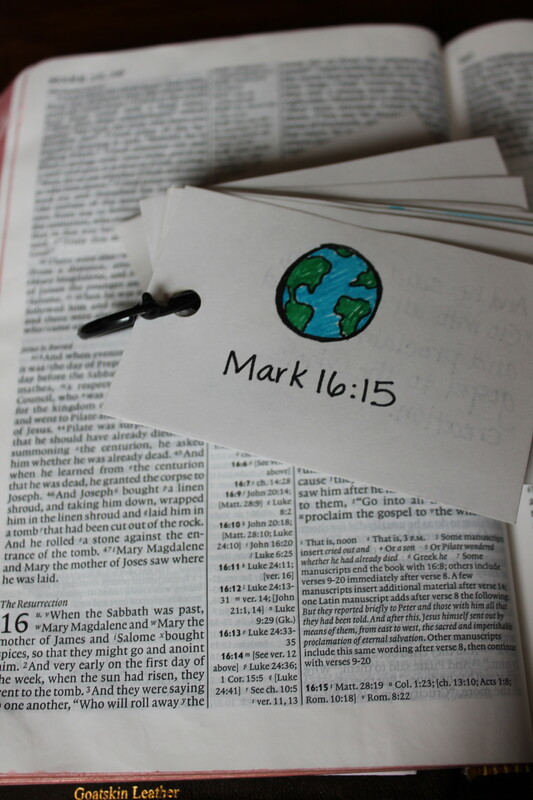 We would love to hear some of your favorite ways to sneak scripture into your children’s minds! However you do it, I pray that God blesses all of us as we try to lead by example in word and deed and that all of our children may grow into strong kingdom workers some day!